IF YOU ONLY READ ONE BOOK THIS SUMMER…READ WONDER BY R.J. PALACIO!!! 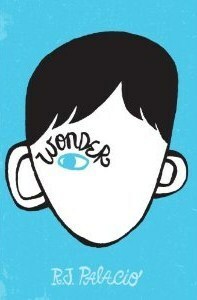 Wonder is the story of August Pullman, a boy about to go into fifth grade at Beecher Prep. August has never attended an actual school before–he’s always been too sick. But he’s stronger now…physically. August was born with a facial deformity which has required him to have 27 surgeries in his first eleven years. I think the only person in the world who realizes how ordinary I am is me. The story of August’s fifth grade year is told from a variety of viewpoints: August, his sister Via, Via’s childhood friend, a fellow Fifth Grade student, and Via’s new boyfriend. Each narrator brings insights into his or her own behavior and feelings which enhance the complete story. Each voice is unique and genuine. This book is by turns joyful, heart-rending, hopeful, hilarious and inspiring. The story is about more than one boy’s journey to continue accepting himself and sharing himself with others. It is about love and friendship and family. It is about growing in compassion and kindness and opportunities to exist with each other in this world together as triumphant spirits of everything that makes life exquisite. It speaks to us of the choices we make for ourselves and in our attitudes and behaviors toward others. It speaks to the difficulty of making those choices. We all know that the ‘right’ choices are rarely the easy ones. So how do you find the courage to make them anyway? The various narrators give us examples from their perspectives. Then it’s up to us. It’s like people you see sometimes, and you can’t imagine what it would be like to be that person, whether it’s somebody in a wheelchair or somebody who can’t talk. Only, I know I’m that person to other people, maybe to every single person in that whole auditorium. To me, though, I’m just me. An ordinary kid. Although I know we won’t be able to finish it before the school year is up, I began reading it to my two Fourth Grade classes this past week. I found it to be such a magnificent, soaring read for me that I am hoping some of the students will be motivated to get the book from the library and finish it on their own this summer. Although we were only able to get 11 pages into it in one class and 15 with the other, neither class wanted me to stop when we ran out of time! I am soooo looking forward to reading with them again our last two weeks! Wonder is a first novel by R.J. Palacio and it is a book that will add to your life in an extraordinary way when you read it!